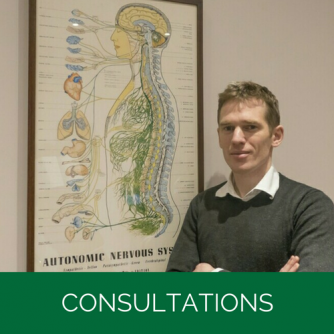 We specialise in a gentle and neurologically specific form of chiropractic the Neuro Impulse Protocol. This Chiropractic offers you Chiropractic without the Cracks. 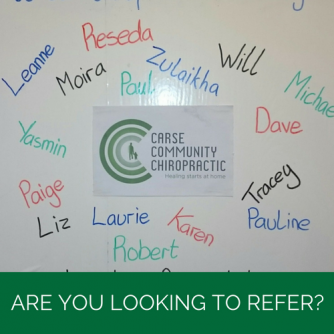 Carse Community Chiropractic’s belief is that chiropractic care like other health measures is there to be utilised regardless of an individuals level of health. We all know we can improve ourselves on a daily basis. A perfectly healthy person needs a good diet, regular exercise, proper rest, a good mental attitude and a nervous system without interference. A person at the other end needs the same.Our health measure in that regard is chiropractic. Therefore this is where the rubber meets the road with our application of chiropractic.The technique used by Carse Community Chiropractic is called the NeuroImpulse Protocol, and is a highly specific and very gentle procedure developed by Dr Neil Davies & taught by him in countries all over the world. 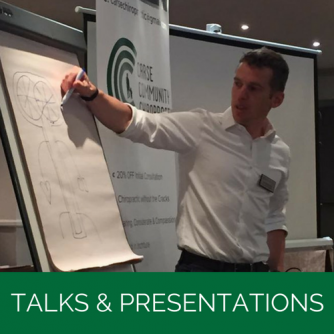 It is a very specific, low force adjusting method which is leading the way in the chiropractic world and is now being brought to Scotland. This is because our focus is on one particular aspect; the spine and its relationship to the brain and nervous system. We exclusively address interferences in the transmission of impulses from the brain to the tissues of the body. These interferences are known as subluxations. Therefore, the subluxations are the sole area of focus for the chiropractor as the correction of these result in your body working better without interference. We want to provide the most effective care and using NIP to pinpoint the subluxation causing dysafferentation to the brain and the nervous system is the most precise way we have found to do this. Think of your brain as being like a computer – if you change the input to the computer, then the output will change. It’s the same for your body; if the information being sent to your brain is changed through having pain or loss of normal movement information from part of your body, then the way your brain controls your body will change. Perhaps you may start to limp or have a change in posture. This makes you susceptible to more aches and pains. The aim of NIP is to re-establish normal input to, and normal output from, your brain. Remember it is your body that heals itself. As the name suggests it is a protocol therefore, we repeat the same procedures and tests to coordinate where to adjust so by the time we set up for a chiropractic adjustment we have assessed your; movement, posture, compensation patterns and associated neurology. This means we have a complete picture as to why that adjustment is required. We do this each and every time you come in, in order to ascertain what is required. The adjusting techniques we use are different to the mechanical manipulations you may traditionally associate with chiropractic. The inability of the brain to immediately match the incoming information with an appropriate output reflects the way that the subluxations all have specific patterns and can occur in layers – just like the skins of an onion. It is not possible to get to the deepest layers until the outer layers have been peeled away. Sometimes the layers are very close together and this may result in you needing more than one adjustment at a single appointment. At other times the layers are more widely spread and you may not need to be adjusted for a longer period of time. This concept of layers is why we recommend a regular course of care, which includes regular reviews, to assess how your body is responding to the care.